TEN management approached GulfStar in September 2011 regarding a potential advisory assignment arranging a $20 million venture-stage investment for the Company. TEN had constructed its initial wireless tower and commenced commercial operations in the Permian Basin of west Texas with founder’s capital and minor friends and family investments. The Company was then seeking institutional capital to build out its network in the remainder of the Permian Basin and expand into the Eagle Ford Shale in south Texas. The proposed uses of funds included the construction of additional towers in the Permian region, purchase of network core and customer premises equipment, acquisition of wireless spectrum in south Texas, construction of Eagle Ford towers, hiring of key personnel and working capital. Within two weeks GulfStar and TEN agreed to the terms of an engagement and began preparing to market the Company to potential investors. Finding the right investors represented an unusual challenge as the product was a leading-edge telecommunications deployment while the customer base was energy companies with a unique set of communications needs. Further, the capital need was substantially greater than amounts at which many venture investors are comfortable deploying in early rounds. GulfStar therefore approached larger venture capital funds and growth-stage private equity groups specializing in telecommunications, energy technologies, or both. Discussions with potential investors quickly revealed that investors active in the oilfield were much more likely to understand the demand dynamics that would ultimately support TEN’s business model. Telecom investors understood the technologies involved but were accustomed to basing wireless network deployments on customer populations and densities, and were thus slower to accept that a wireless network consisting of tens of thousands of machine-to-machine communication nodes could provide a large enough subscriber base to justify buildout. Conversely, active energy investors, whether focusing on exploration and production or oilfield services, were typically keenly aware of the benefits of real-time data collection and monitoring across a variety of activities and the lack of existing technologies to reliably communicate such data on a cost-effective basis. By early 2012 GulfStar and TEN had narrowed the list of potential investors from more than 100 to a small handful with the resources and understanding to move quickly. Several groups were invited to perform additional due diligence, speak with existing and potential customers, meet with management and perform site visits. As an early-stage business, the Company was consuming cash and needed to move quickly to secure funding. 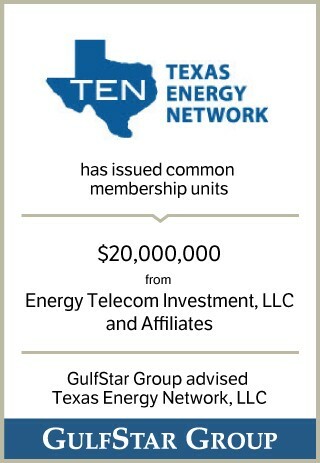 By late February 2012, TEN management and GulfStar entered into a period of exclusive due diligence and document negotiation with a consortium of private equity investors and oil and gas industry executives who brought not only capital but also relationships with senior management at a wide range of potential customer companies. An initial $5 million investment tranche funded on May 9, 2012, followed by a further $3 million in August. The remaining funds are expected to be called in mid- to late 2013 to complete network expansions in each region. TEN and its investors intend to replicate this deployment strategy over other remotely located oil and gas fields nationwide with total invested capital of up to $100 million.